As I prepare for my imminent arrival at life's first time control I find my thoughts have also turned to the question of how I’ve been spending my time when seated at a chess board. "You don't need to be a great player to know that time management is as important a feature of the game as accurate calculation, opening preparation, intuition etc." Strange, then, that of the countless books, magazine articles and blog posts the game generates hardly anything is written about how to make the best use of the clock during a game. Indeed, amongst the far too many books I’ve bought over the years I can only think of two - Simon Webb’s Chess for Tigers and John Nunn’s Secrets of Practical Chess - that actually address this area in any depth. Webb’s chapter on clock control suggests that the best way of finding out where your time is going is to make a note of the clock times after every move. This quickly becomes second nature*, the difficult part being rembering to take the trouble to review the game at some later date**. It takes a little bit of work but it's almost certainly going to help your chess more than another hour or two spent reading some new openings book. and (b) a win for me but more importantly for today's purposes it demonstrates rather clearly many of the problems I have with time management when playing chess. All the moves were to be played in an hour and a quarter. I ended up using 72 of those 75 minutes but taking a second look at it I have to admit that an alarming proportion of the time I spent "thinking" was at best wasted and even counter productive in some cases. I was still within my opening knowledge at this point but nevertheless I think the pause for thought was quite appropriate. I’ve faced lines with an early c2-c4 a bunch of times over the years and until this game had always played set-ups based on … Nf6, … Be7 and … Nb8-d7-b6-d5. This time, however, I wanted to try out John Watson's suggestion from Play the French 3. 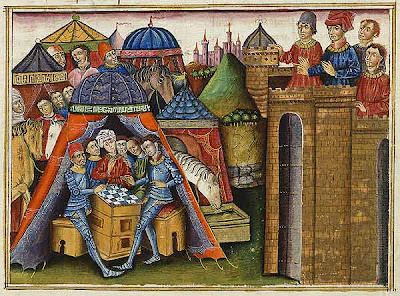 As I was about to head into positions I hadn’t actually played before spending a little time reviewing the main plans and whether or not there were any particular tactics to look out for seems time well spent. That said, given the short time control for the game taking 5 minutes for this is probably a little indulgent. It's not until White's next that I ran out of 'automatic' moves so I'm at a loss to explain why it was that I spent two minutes each on moves seven, eight and nine. It might have been justified had I not just had a decent think on move five but to do both is just ridiculous. With the contest just leaving the opening stages I'd already managed to dither away 8 minutes of the game. Proportionately I'd already given away just as much time as Peter Wells lost against Smeets by failing to turn up on time. 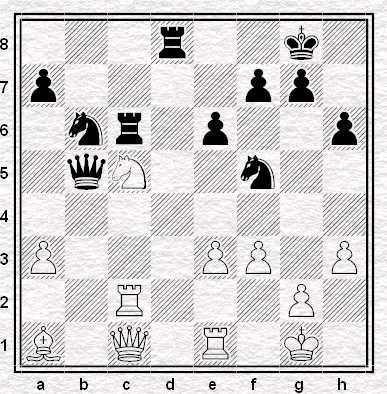 My idea was to exchange on f3, take on d4 then after White replies Qxb7 gain some time by knocking the queen around or perhaps even trap her. In fact this is just a bad plan but that's not relevant in terms of clock management. More to the point ... Bxf3 is a classic case of Don't Analyse Unnecessary Tactics (DAUT). Even if it works it’s obvious that after … Bxf3, Qxf3 Nxd4, Qxb7 there will be a lot of variations to consider. Had I thought sensibly it would have occurred to me that I should hold this line back to analyse only if I could not find anything better. 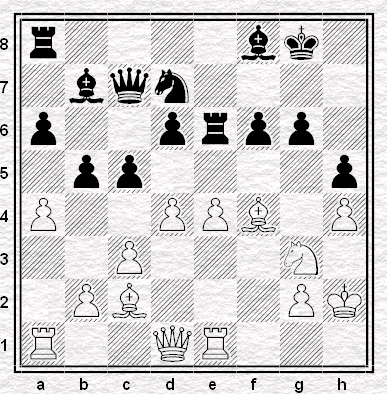 Perhaps then I might have chosen … Rb8 (setting up the idea of taking on f3) or more likely … Nf5 (simply adding to the pressure on d4 with no difficult tactics to analyse). 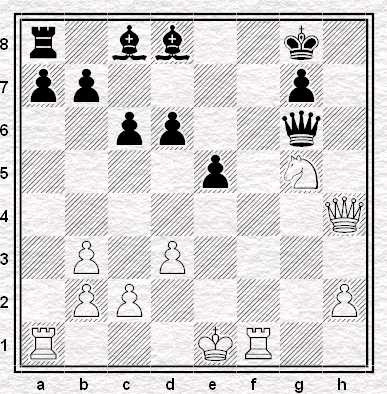 As it happens both of these moves can be found in Watson's book. In any event, a different thinking process would perhaps have taken three or four minutes at most to produce a move. Not only would I have saved ten minutes I would probably have played better too. I took two minutes on this which would seem to indicate that I lacked confidence in my plan. In fact it's not too late to back out and find a different way to play. The trouble is, as John Nunn pointed out, after a very long think it can be psychologically difficult to choose a different path and admit the time has simply been lost. Of course the worst of all possible worlds is to worry about things for two more minutes then play the move anyway. At this stage although I've already used up over a third of my time for the entire game and yet I'm only just out of book. 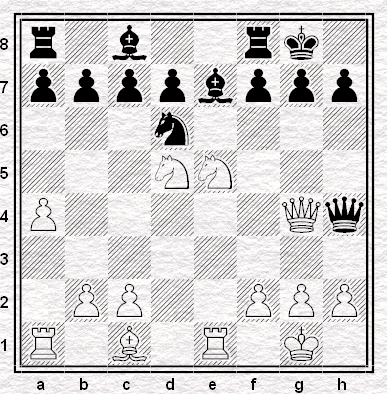 I hadn’t considered that White might simply sacrifice the pawn and go for a direct attack. 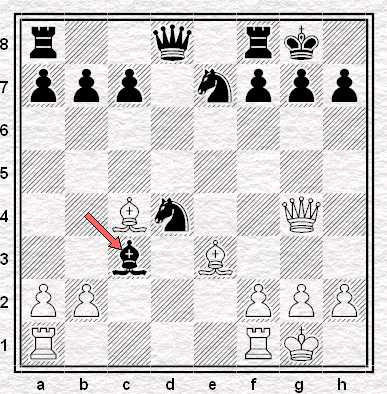 Without much thought at all I gave up my bishop to stop the knight bouncing over to the king side. 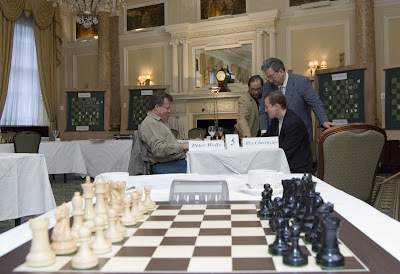 This was definitely an occasion where I'd have benefited from a couple of extra minutes to weigh the benefits of eliminating an attacking piece against handing White a pair of unopposed bishops on an open board. Of course having used up so much time on move ten I was now in a position where I'd have to cut down on the analysis and hope for the best to a certain extent. So what to do? 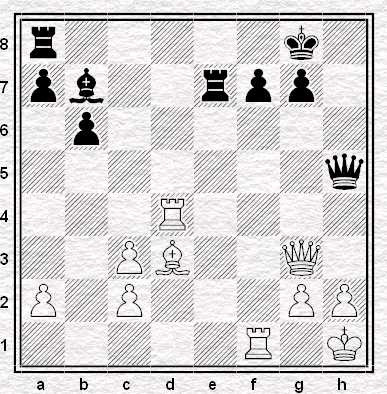 Bring my last piece into the game or play ... Kf8 before or after swapping rooks on the e-file. At the time I wasn't clear whether exchanging rooks would help me or merely emphasise the strength of his bishops. In fact after a few months to think about it I'm still not clear what's best. I frittered away a few more minutes here simply because I couldn't decide on what course to take. Unfortunately I chose one plan then the other and worse still spent ten minutes doing it. An interesting moment. 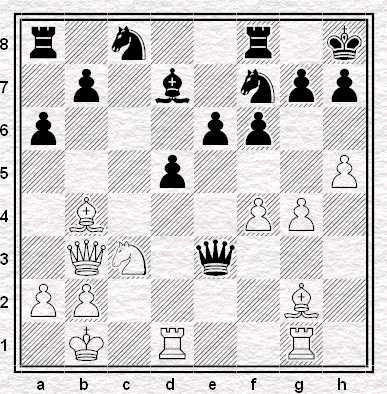 I'd already seen his rook was vulnerable to a knight fork but on the other hand his bishop attacks my a-pawn. With a bit more time to think I might have put these two ideas together and realised the a-pawn can't yet be taken without allowing a knight check on d2. My dawdling earlier had left me with little more than a quarter of an hour to finish the game by this point. The rook ending is obviously much better for me but is it winning? With pawns on one side of the board general principles suggest my knight should be better than his bishop so perhaps I want to keep minor pieces on the board anyway. Pressed for time I made the exchange after less than a minute's thought. It worked out well in the end but in less favourable circumstances this could have been the point where I let the game slip away. Needless to say, had I not haemorrhaged the minutes away earlier in the game I would have had plenty of time for a proper think here. I hadn’t foreseen that he might go after my a-pawn but when he played Ra5 it occurred to me that he might not actually have the time to take it anyway. 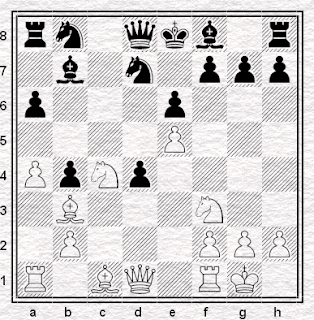 Since there’s nothing to be gained by worrying about this, since there’s nothing I can actually do to stop him capturing the pawn even if I’d wanted to, I just pushed … c6-c5 instantly and hoped for the best. Normally I'd have lost some time to self-recrimination and worries that I'd thrown the win away but I'd finally woken up and actually started to play sensibly (timewise at least). Incidentally, throughout this ending I was plagued by the recurring thought that it would be an awful lot easier had I actually read some of the rook endgames book (John Emms’) that has been sitting on my shelf for many years. 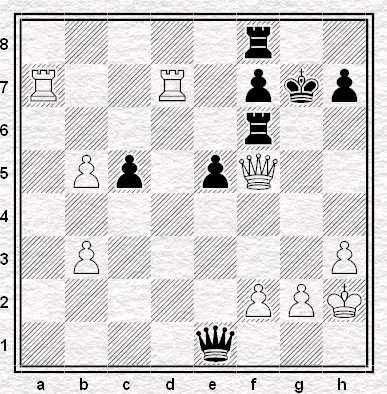 Things turn out pretty well - though your guess is as good as mine as to why I moved my king in front of the pawn on move 51 - but in a less straightforward position my lack of basic endgame knowledge could have cost me a lot of time which in turn might have made the difference between winning and drawing the game. There’s no need to do this of course, Fritz takes just a few moments to find mates in 9 after both Ke2 and Ke1, but with my nerves shredded and just three minutes to go I wanted to be able to stop thinking and ensure there was absolutely no way I could lose. 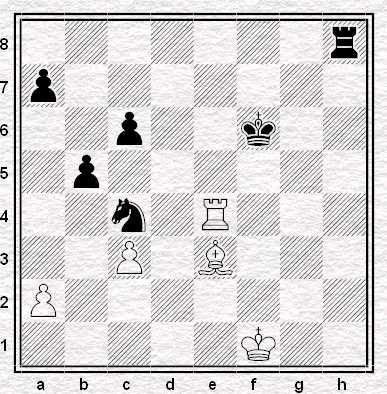 White resigned at this point but I think I might have been tempted to make him actually mate me. It shouldn’t go wrong of course but Black is close enough to flag fall to make playing on justified. So happily enough it all worked out in the end but it could easily have been very different. 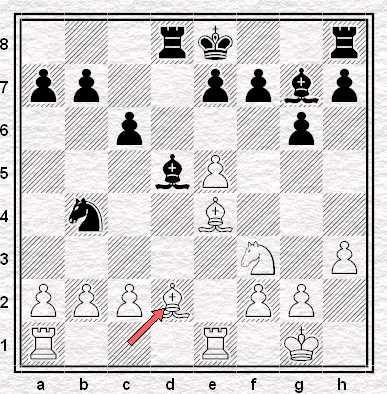 With a better clock handling I would have been able to play the opening and early middlegame much quicker and saved the time for critical moments later on. * I've been following Webb's advice religiously ever since I bought the second edition of his book in the early 90s. ** Sadly Webb neglects to mention simply recording the move times alone will not be of much use to you. After more than a decade of painstakingly keeping track of the time taken for each chess move I made in serious games it was only earlier this summer that I actually got around to making any attempt to systematically analyse the data I'd been gathering. This is a pathetically embarrassing state of affairs, the only possible benefit of which is that it's led to this aside - and I do love a good footnote. One of the things about the approach of a big birthday is that it inevitably leads to a review of life so far and thoughts of what might have been. Chesswise, at least, for me this process could be worse. I've lost any number of games in any number of stupid ways (e.g. here) but I can't say I regret any really important losses if only because I've never been in a position where winning or losing really mattered. Sure I've sulked for the rest of the night and even into the following morning but that's about it. I wonder what it would be like to recall winning positions against, say, Ivanchuk and Anand but on both occasions I'd missed the simple tactical sequence that secured the win. That, I rather think, would tend to keep me up at night from time to time. A hundred years ago such was the fate of one S. Lipschuetz who must have spent much of the rest of his life kicking himself after failing to beat Zukertort and Lasker. today's positions have been taken from Geoff Chandler's Contribution to Master Chess: A course in 21 Lessons, Pergammon Press 1985. 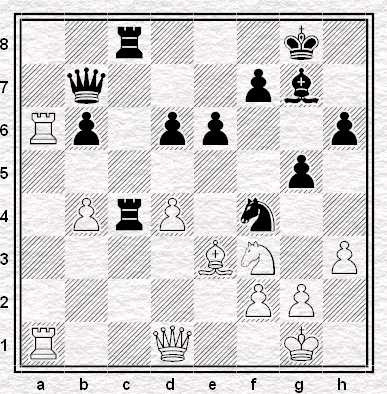 My database suggests in the second position there was a Black pawn on c5 and the White rook was on f4 not d4. Some entertaining internet stuff recently has caught my eye, recommended for your perusal on a lazy and rain-laden and bank-holiday-weekend Friday. First up, you might not think that a blog called USCL news and gossip would promise much entertainment, but don't let the name fool you. Recent articles have featured: a T-shirt with the slogan Thou Shall Blunder on it - imagine facing that over the board; a report on how chess in the US is exploding with lawsuits - on which note, see also; entertaining and honest annotations to an interesting game; a humorous post comparing Susan Polgar's husband Paul Truong with Sam Sloan, now accompanied by a poll in the side bar; testosterone; and, well, much else besides. Definitely worth keeping an eye on the whole thing, and I've added it to our sidebar. Secondly, ever wondered what would happen if you crossed a chess board with a subway map? Tom Brown has, in multiple posts across his blog. 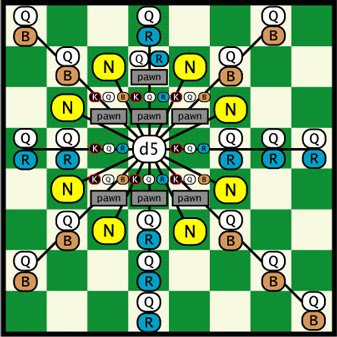 In fact he's constructed such a map showing every move for every piece on every square of the board, in subway map style. To the right is d5. If you explore his blog you'll find the rest. Next stop is Grandpatzer who seems to have answered the question Was Alekhine Unaware of the Noah's Ark Trap? with the surprising: yes, he was. Finally, The World Team has been winning against high-class opposition again. 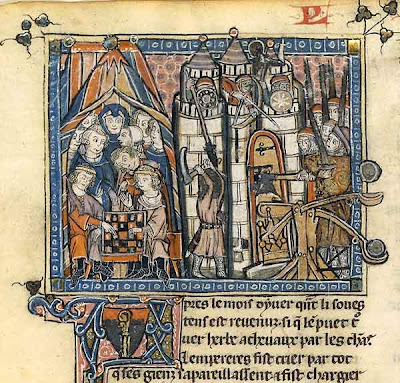 This time they beat 15th World Correspondence Chess Champion Gert Jan Timmerman at the website Chess Games in a complex struggle. 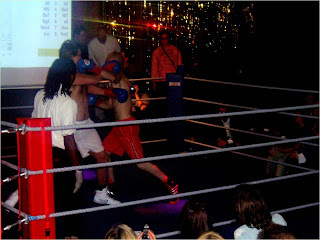 From the looks of the website's newsletter 31.b4!! was the key move, a move with thousands of hours of computer analysis behind it no doubt. The World's next game is against well-known correspondence Grandmaster Arno Nickel, who's out for revenge with the white pieces after a previous loss with black, and you can find out more as well as how to join in the fun here. And that's it for today. Enjoy the extended weekend. Club – is pointless or doomed to failure. sensation' Sascha Wandkowsky and Holland's Hubert Van Melick. this was not one for the purists. Green's non-chess playing fraternity thought about the chess, too. accurate analysis for the baying masses. "Darling, just give me the damned pen." "What pen?" she says, so innocent. "You don't have time to look for it now. Just take that one instead," she goes on, wafting me toward some grotty biro. "What pen? The lucky pen. The black one. The one I told you about. 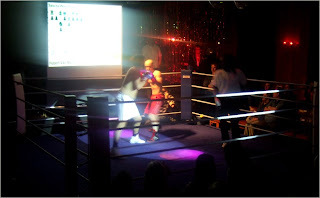 The one I won with last Tuesday. I left it on the table this morning." "The sleek-looking one? That writes so nicely? Not seen it. It's probably in your bag." "It's not - I -" and then, I see it. There on the bookshelf, tucked inside one of her folders. She knows I know, she sees I see. Across the table we eye each other. A mad dash and . . . I grab it first. Lucky, I say to myself, scampering toward the door, feeling ready at last for the game tonight. "You know it makes no difference," she says glumly. "It's just a pen. But good luck!"
. . . and, yes, of course I still know now what I also knew then. The pen was not a lucky pen, invested with magic properties. It was just a pen, black ink, available from a newsagent around the corner, along with dozens like it. So what that I had won with it the week before? I also won wearing a certain pair of socks, having washed my hair with a certain shampoo, having been a certain number of minutes early or late, having had a certain sandwich for lunch, and none of these things I thought of as lucky. And I know they make no difference. Not like my lucky pen. What was I thinking? I had never been a superstitious person, after all. But as I strolled relaxed and confident to the club, I wasn't thinking about much at all apart from getting to the game along with my lucky pen. But a few weeks before, I'd been thinking a lot about superstition, luck, the little acts of ritual top players acquire, their odd beliefs. Like seventh World Champion Vassily Smyslov's belief he was kept alive after his eyesight failed for some divine purpose, related in some unknown way to harmony and endgame studies. Like twelfth World Champion Anatoly Karpov only washing his hair after defeats. Like thirteenth World Champion Garry Kasparov's belief that his lucky number was, well, number thirteen. Like Grandmaster James Plaskett's beliefs that coincidences weren't just coincidences, something suggested too by Grandmaster Jonathan Rowson in the Acknowledgments to one of his books. Like . . . the list could go on and on. I'd been thinking how these little beliefs must have some benefit to the players who employed them. Something along these lines: what's the point of worrying about the result of your next game, if you've managed to convince yourself it's particularly related to a certain pair of gloves? Then all your anxiety, all your nerves - all these little things that punch around before your games like little fists in your stomachs - could simply be smoothly tucked away by use of superstition - in a favourite pair of gloves. Or, you're at the board itself, and you start to lose track of the position, miscalculate, and suddenly all your doubts balloon up - wouldn't it be nice to puncture them by tapping on a favourite tie-pin? That is, your lucky tie-pin, the one you always fiddle with when calculating clearly? I'd been thinking that if I could really get myself to believe something like that, then maybe I would be able to arrive at the board itself in a better state of mind. How about a lucky pen? Then I could look at my pen as though it determined all the luck in the world, and so concentrate fully only on the board itself. Would I try it? Maybe. 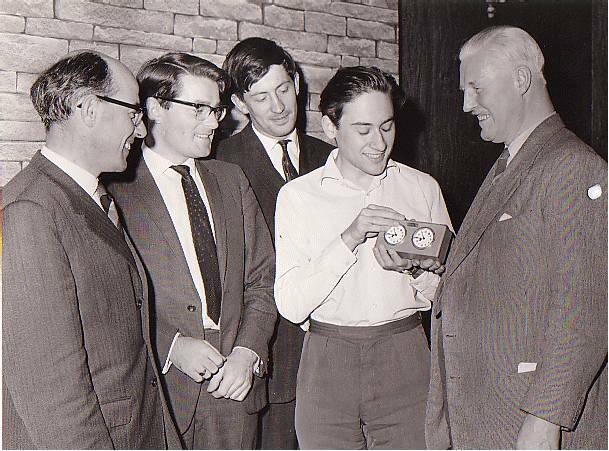 After all, one thing that improving at chess had taught me, was that I wouldn't know in advance what would work, what would not work. Maybe superstition would work, maybe it wouldn't. Who knew? But I wanted to work one thing out first. Why were more talented players frequently more superstitious than less talented players? My guess was as follows in the next three paragraphs. Why are strong players superstitious? Why aren't weaker ones? 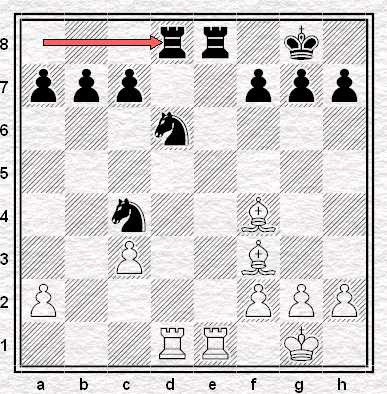 The way I guessed it was that for the most talented players, the world outside of chess is never demystified. No nihilist biology teacher ever convinces them that all their actions and feelings and thoughts are nothing but confused ciphers for the brutal and basic wishes of their genes - they are too busy playing around with the chess set in their desk draw, coming to terms with the passed pawn's lust to expand. They are never disappointed to find out there is no tooth fairy swapping their milk teeth for coins, or no Santa delivering gifts, or no real Lord of the Rings - because last weekend some company magicked them off to Moscow, where an ancient white-bearded creature - just like Gandalf in fact - clarified for them what black gets in return for the Sicilian ..Rxc3 exchange sacrifice. 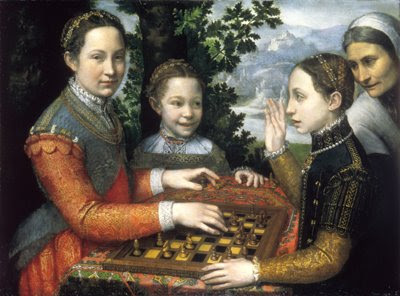 Meanwhile, because of their talent, the world on the chess board becomes increasingly demystified as they grow-up. Maybe there are dragons in the real world, maybe not - but certainly not in the Sicilian, because they have mastered the logic of this oddly-named variation by the age of ten, and all the intricacies follow by their late teens. 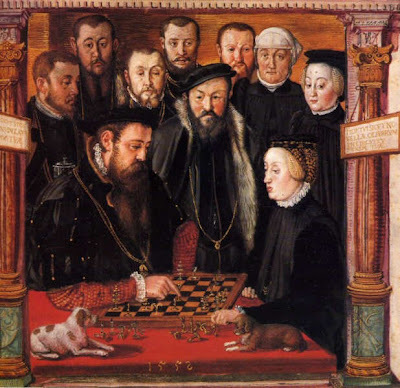 For the talented chess player, the world is thoroughly mystical, enchanted with irrational forces, the whims of the goddess Caissa wafting around arbitrarily: but the chess board is the one objective plane of cause-and-effect. The phrase fire on the board is just an advertiser's mystical metaphor for dynamics. For the less talented player, like myself, things are the other way around. 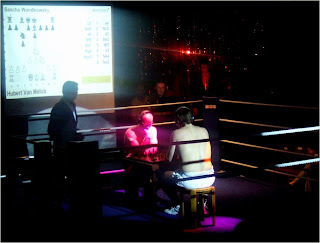 The chess board remains a mystical place, full of impossible goings-on: Grandmasters perform incredible feats of calculation, make the International Master who creamed me look like an idiot - what . . . ! ! ! And positions we are sure are winning turn out dead-lost, and we practice against computer programmes three-pieces up and they magically turn it around, random combinations appearing out of nothing, like a sky of crows flung from a magician's hat, and all the remarkable improbabilities the world would never allow come alive. The great players of the past aren't just great players - they're titans, or magicians, or whirlwinds, or pythons. Elsewhere, we've already learnt otherwise, learnt the world's cruel lessons. That the world is not flat, as our childhood feelings tell us. That the horizon not infinite, that the stars are there all the time, that the sun does not rotate around us. And so, thanks to this disenchantment, this initiation into the dry factual state of being called adulthood, we've already learnt to dismiss our innermost feelings as fabrications, our fundamental intuitions as idiocies - already learnt that the miraculous is impossible amidst the deterministic routines of the real world. Impossible. 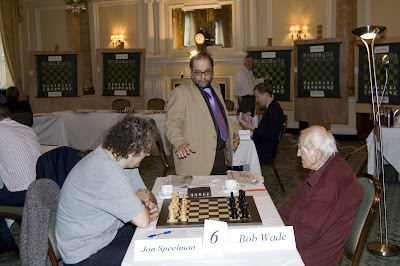 Impossible anywhere, that is, but amidst the beautiful unpredictability of the chess board, where all laws come undone. What does all this mean? 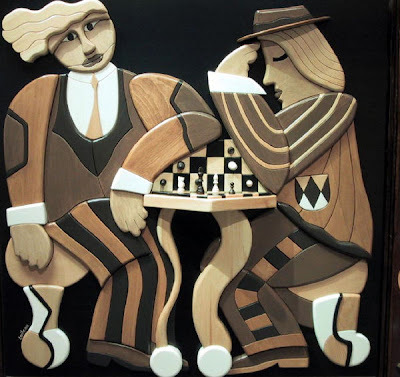 The talented chess player benefits from living amidst a highly-subjective world, whilst the chess board for him remains solely the realm of objectivity. All the strange habits of talent acquired in the real world - all the superstitions, the lucky objects, the little rituals - make perfect sense to the talented chess player, who does not know he is constructing totem poles in his shirt pockets. The less talented player scoffs at these habits, because he has never had cause to create them for himself. 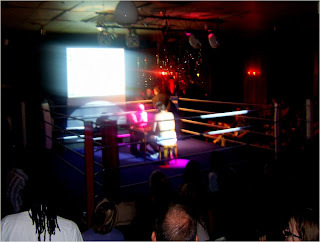 But for the talented player, these little acts of madness, the momentary subjective nothings, function to keep the world as crazy it is, so they can come to the chess board and once again find it the zone of crystalline truth and artistic clarity, and meet the facts of the fight with as much objectivity humanly possible. Or something like that. Out of all this thought, anyway, came the following basic reasoning: talented players acquire, by accident, strangely-subjective habits in the real world. These paradoxically function to keep their thoughts at the chess board itself as objective as possible. But whilst less talented players such as myself do not acquire such habits as a matter of course, there was no reason not to choose to develop them consciously and deliberately. That way we can make use of the various functions of superstition and ritual, such as concentration, calmness, focus, and so on. And so, I bought myself a lucky pen. No-one knows in advance what will help improve their chess, what not. However, there are reasons to believe that superstitions or similar based in the real world and off the chess board help talented players achieve their full potential at the chess board itself. Paradoxically, this is because they allow the talented player to be more objective at the chess board. Less-talented players do not acquire such superstitions normally, but can acquire them by choice. However, this should all be kept in perspective. Whilst I did acquire myself a lucky pen, and whilst my chess did improve, I think the majority of the improvement came from more direct methods such as those previously discussed. The final round of the Staunton Memorial starts today at 12noon at Simpson's-in-the-Strand, and will probably finish between 5 and 6pm. So several of us are going along after work at 5pm to see the games, and we plan to go out after, have a drink or two, and so on. All are invited to join us. As of today, dear reader, I have just one month left of my thirties. The belief that life begins at 40 is a myth. Research has found that the fourth decade heralds the beginning of the end. Time, I think, to get few a easy chuckles by mocking those less fortunate than myself. Normally of course that would mean a visit to Chess Now* but today I'll go the other route and take a look at a choice example of the embarrassing resignation. The position below is taken from Geoff Chandler's chapter on Tactics and Combinations in Master Chess: A course in 21 Lessons, Pergammon Press 1985**. 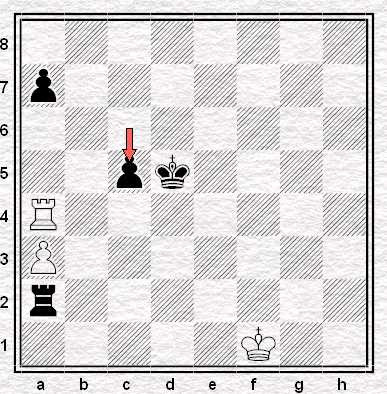 White is threatening 1. Rxh7+ Kxh7, 2. Rh1+ Bh6, 3. Qxh6 mate. 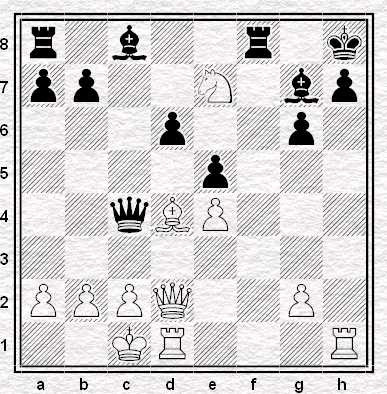 Although Black threw in the towel here he has a move that not only saves the game but even wins if White tries to force a mate by sacrificing the rook on h7. You work out what it is while I spend the day getting ready for my impending doom. 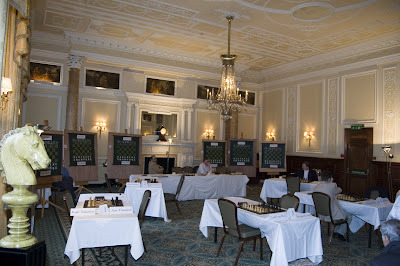 Judging by the overflowing crowd at the venue last night, or by the Grandmasters merrily analyzing away in the bar after their games, or purely by the entertaining chess being played, one would think this year's Staunton Memorial Tournament another unqualified success. Yet organizer and arbiter Eric Schiller's interesting Behind The Scenes article suggest a problem with certain metaphorical termites: a problem which threatens the very future of the event. These termites, says Schiller, are people who complain on the internet about certain aspects of the event - such as the inclusion of underdog Bob Wade - whilst attacking the organizers personally. The termites threaten to destroy the Staunton, as they have destroyed many fine tournaments in the past. 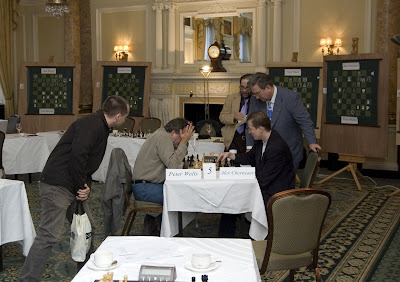 Keep in mind the hard work required to put on a major chess event and don’t become a termite! I hope we’ll have another fine event next year, but the insidious insects try to make this less likely. Indeed, it would be a real shame for London to lose the Staunton Memorial, and I've often wondered why Dutch sponsor Jan Mol hasn't considered moving the event to Holland. Still, the negative comments on the internet are clearly in the minority, and it's usually best not to engage in such squabbles anyway. On which note, the tournament website has today introduced a positive response, in the form of a new page called Quotes. In fact already there's two enthusiastic comments there to read - one from Shaun Taulbut and one from Andrew Martin - and there is also an email address provided for fans to send in comments. 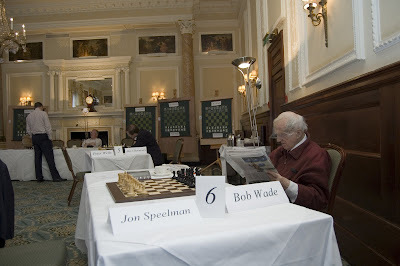 Will local chess-loving Londoners - who perhaps feel lucky to have this tournament held here each year - follow suit and email in their support to help bolster this event? Or will this summer see the last Staunton Memorial - with all that remains a dust-pile at the centre of our city, the termites scuttling off in search of fresh wood for next summer? Following yesterday's rest day for the players (though no day off for the organisers who've been busy on the internet), the Staunton Memorial resumes this afternoon at Simpsons-in-the-Strand. At the halfway point, van Wely is in second place with 4/6 closely followed by Smeets, Timman, Short and Speelman on 3.5/6. Of these five Smeets and van Wely have the advantage of not yet having played either Cherniev or Bob Wade. The latter pair are the tournament back markers and by some margin the lowest rated in the event, so the two dutchmen should probably be considered as having their noses some way in front of the three former candidates. Out ahead of everybody, however, sits Michael Adams who has a very perky 5/6. Handing out spankings to Werle, Timman, Smeets and Wade has given him a rating performance for the first half of the tournament that works out to a shade over 2800 and he's looked almost totally invincible so far. Adams played 15. Bd2 apparently totally missing Black's idea. It could have been a lot worse but as it turned all he suffered for the oversight was the loss of any possibility of playing for an advantage. 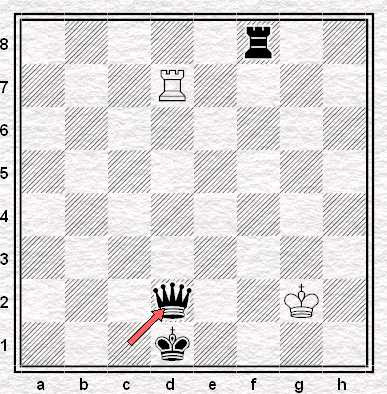 The game burned out to a completely level position and was agreed drawn five moves later. Who was it who said the good player is always lucky? Curiously the day before his encounter with Short, Adams had missed another simple (by his standards) tactic. 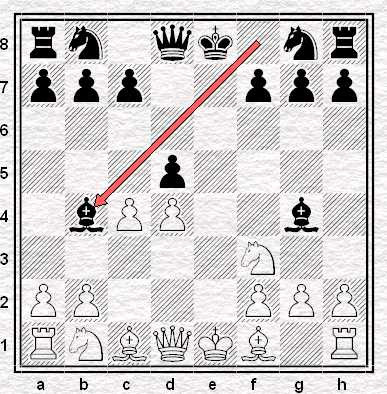 Wade had just retreated his queen from c2 to d1 in response to the capture of a pawn on c4. After a few minutes thought Adams played 35. ... Nd5. 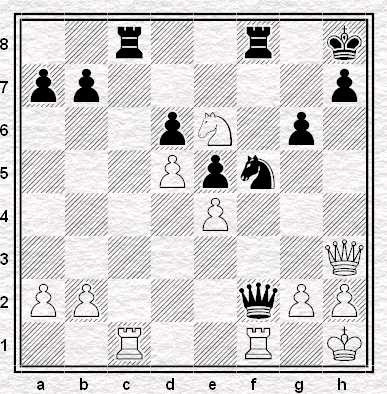 It's certainly an attractive move since it leaves Black a pawn up with a knight blockading the isolated queen's pawn which is infinitely superior to White's horrible bishop on e3. It's difficult to imagine anybody surving this against Adams, least of all a semi-inactive opponent several hundred rating points out of his depth. Wade did indeed resign a few moves later but just like Nigel Short it seems Mickey Adams doesn't always pay attention to Tuesday's second aphorism. It may be slightly harsh to point this out since he is winning anyway but in the diagram above Black has a neat tactical sequence that ends the game at once. I realised this while I was watching the game waiting for Black to play. Not that I'm a tactical genius you understand. Andrew Stone pointed the key move out to me no more than five nanoseconds after Wade had retreated his queen. Adams is obviously one of the greatest chess players the country has ever seen. According to chessliverating.org his performance during the first half of the Stauton Memorial has lifted him back into the world's top 10. 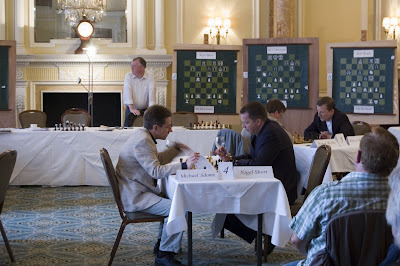 Doesn't that illustrate the underlying attractions and frustrations of chess? If a player of Adams' class can make such simple mistakes what chance do the rest of us have? Chess is just impossibly difficult. Though not, it would seem, too difficult for Andrew Stone. * Not quite their first game this century as we'd thought yesterday. 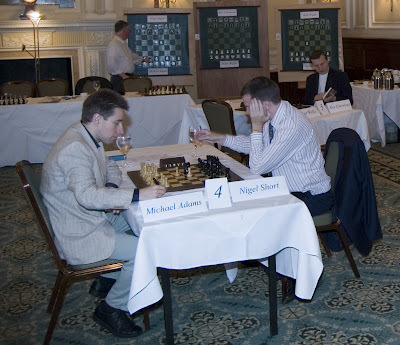 It seems they played three games in 2001, the last being a 33 move draw in the 4NCL in May of that year. 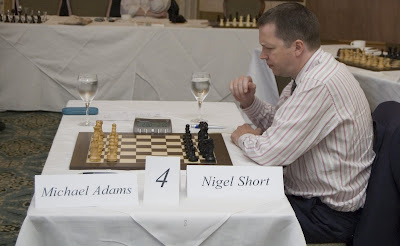 Thanks to Vad for these splendid pictures of yesterday's Staunton Memorial Tournament, which witnessed the first clash between the English greats Adams and Short this century, I believe!
. 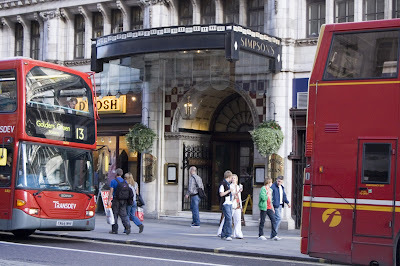 . . the venue Simpson's-in-the-Strand from the outside, sandwiched between two buses . . .
. . . who'd know it was hosting a chess tournament? But inside things are getting ready. 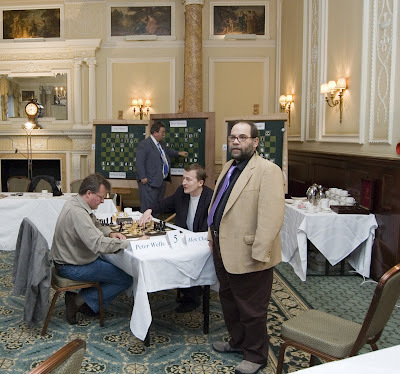 Nigel Short waits for Michael Adams, looking fully concentrated . . .
. . . while Bob Wade peruses the paper - perhaps looking for pointers from Ray Keene's chess column? The games begin. Arbiter Eric Schiller stands behind the two players. Meanwhile, Short has surprised Adams on move 1, playing the Alekhine with the black pieces . . .
. . . but the game soon peters out to a twenty-move draw. 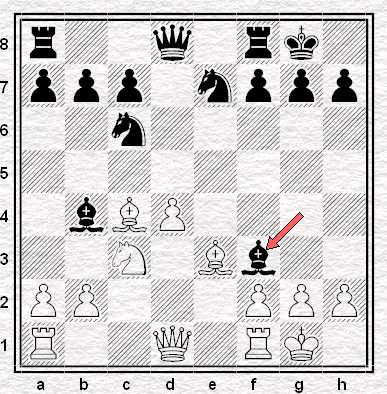 Looks like the fianchetto variation, where with white against Timman back in 1991, Short won a well-remembered classic. 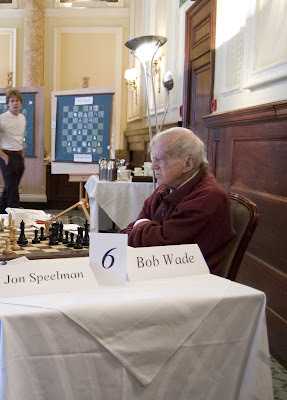 Things will not prove so nice for Bob Wade, however, in his game against Jon Speelman. Wells and Chernyaev look to be the last to finish. Soon there'll be nothing for organizer Ray Keene (in the background) and arbiter Eric Schiller (foreground) to do for the night. 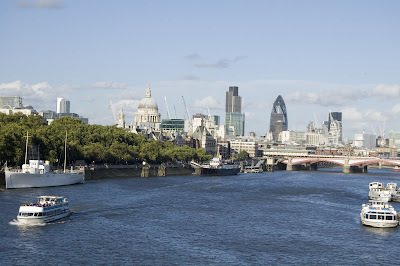 Except of course outside there's London, where there's always things to do! Thanks again to Vad for these great photographs. The homepage for the tournament is here. Today is a rest day, but the tournament continues from Thursday until Monday from 2pm each day (except on the final day, when they start at noon.) Entry to the venue on the Strand is free and highly recommended.